We have the lowest prices on Texas Hunter Feeders! Utilizing a high velocity air stream to project feed pellets into the water, this feeder delivers a wedge-shaped feed pattern approximately 45 feet in length by 20 feet in width. The EZ Set Digital Timer – backed by a 5-Year Limited Warranty – controls a specially engineered dual motor system. A metered flow of feed is introduced directly into the air blower assembly, eliminating the need for problematic augers, solenoids or shut-off gates. 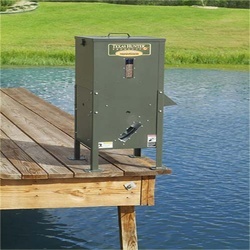 When making your purchase, please select Adjustable Legs (shown) to easily level feeder on uneven terrain or sloping pond banks, or Straight Legs to reduce the feeder’s footprint when mounting on a pier or dock. Built-in ‘nut-serts’ make leg installation a breeze!